Product prices and availability are accurate as of 2019-04-11 14:08:30 UTC and are subject to change. Any price and availability information displayed on http://www.amazon.com/ at the time of purchase will apply to the purchase of this product. The ROES-PH75 is a 6-stage 75 GPD reverse osmosis water filtration system that adds calcium minerals to enhance the water taste for people who prefer mineral water. 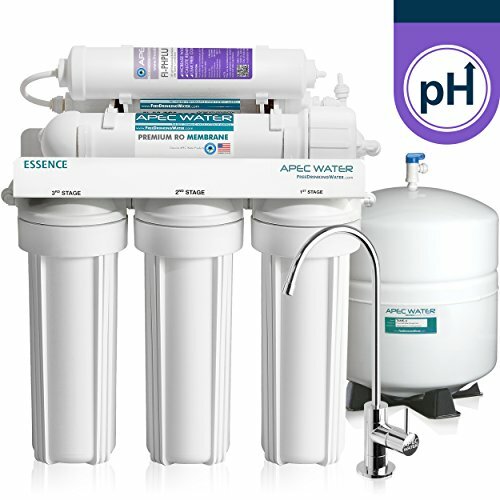 This system's mineral cartridge adds only 100% US-made high-purity calcium carbonate to effectively raise pH in the water for those who desire alkaline water. Other re-mineralization reverse osmosis systems will claim to add various beneficial minerals back into the water; however, their mineral formulations are often from unknown and uncertified sources that can lead to potential health concern. With the ROES-PH75 RO system, users will enjoy unlimited great tasting healthy water right at home for drinking and cooking. Save money, time, and from buying costly, bottled water and live healthier with ultra-safe pure mineral water that is contaminant; worry free. 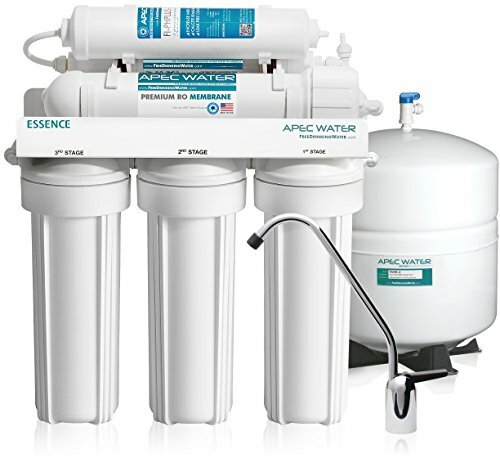 Designed, engineered and assembled in the USA, this 6-stage water filtration system is made from high caliber components to deliver exceptional contaminant rejection rates and long-lasting, reliable performance. 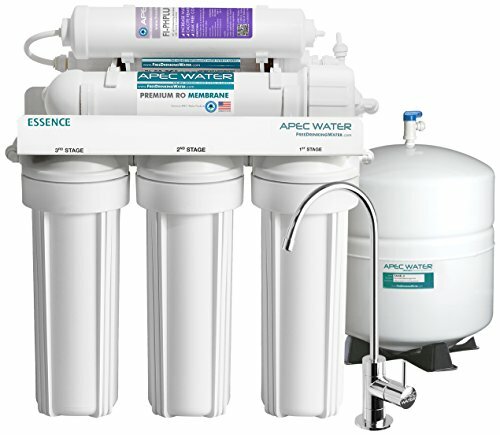 Based off APEC's 20 years of experience in reverse osmosis systems design and production, this system will provide users with high-quality safe drinking water for many years to come. 1st Stage: High-capacity polypropylene sediment filter removes dust, particles, and rust. Protects and extends the life of the membrane and system. 2nd & 3rd Stage: Premium extruded carbon block gets rid of unpleasant chlorine, tastes, odors, cloudiness and colors. Also removes VOCs and other common chemicals from the water. 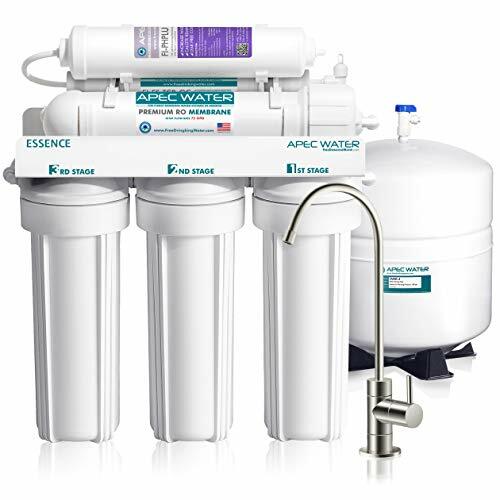 4th Stage: High Rejection TFC reverse osmosis membrane removes up to 99% of total dissolved solids (TDS - total dissolved solids) and contaminants such as arsenic, lead, fluoride, chromium, radium, bacteria, viruses and much more. 5th Stage: Advanced coconut shell refining carbon filter (TCR - Total Contamination Removal) removes any possible residual taste from the tank. 6th Stage: PH+ alkaline re-mineralizing calcium filter adds calcium carbonate to increase water alkalinity. Enjoy ultra-pure Drinking water with added calcium minerals for improved alkalinity and great taste US made cartridge uses food-grade calcium from trusted source for safe, proven water ph enhancement Premium long lasting filters used to treat tap/well water. 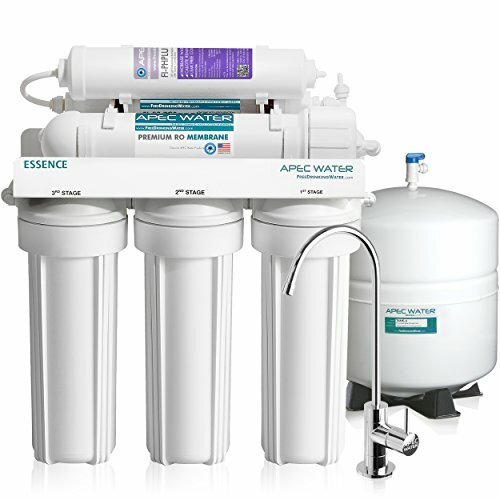 Provide unlimited clean Drinking water 75 gpd 6-stage system removes up to 99% of bacteria, viruses, cysts, organics, chemicals & more Top rated brand of US-Made, high performance, trouble-free system with best support and warranty System Dimensions: 16"w x 5.25"d x 17.5"h Tank Dimensions: 11" x 11" x 15"